Verdi's Rigoletto, from the Metropolitan Opera in New York, starring Vittorio Grigolo, Nadine Sierra and Roberto Frontali. Nicola Luisotti conducts. Opera on 3's From the Met season continues with Verdi's Rigoletto, based on a controversial play by Victor Hugo, 'Le roi s'amuse'. It tells of the Duke of Mantua's hunchbacked jester and outsider, Rigoletto, who has brought up his daughter Gilda, soprano Nadine Sierra, in seclusion from the world. 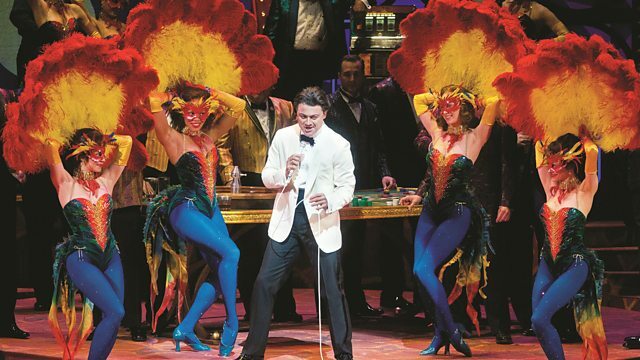 Rigoletto, sung by baritone Roberto Frontali, is cursed by the father of one of the Duke's victims after he mocks him - but the curse seems to take effect when the Duke, star tenor Vittorio Grigolo, seduces Rigoletto's innocent daughter Gilda. Las Vegas, 1960. At his casino, the Duke boasts of his way with women. He flirts with the wife of Ceprano, one of his entourage, while Rigoletto, the Duke’s hunchbacked sidekick and comedian, mocks the enraged husband. Marullo, another one of the Duke’s entourage, bursts in with the latest gossip: Rigoletto is keeping a young mistress at his place. Unaware of this, Rigoletto continues to taunt Ceprano, who plots with the others to punish Rigoletto for his insults. Monterone, an Arab tycoon, forces his way into the crowd to denounce the Duke for seducing his daughter and is viciously ridiculed by Rigoletto. Monterone is arrested and puts a curse on Rigoletto. Rigoletto is disturbed by Monterone’s curse. He encounters Sparafucile, a hitman, who offers his services. Rigoletto reflects that his own tongue is as sharp as the murderer’s knife. Arriving at home, he warmly greets his daughter, Gilda. Fearing for the girl’s safety, he warns the housekeeper, Giovanna, not to let anyone into the apartment. When Rigoletto leaves, the Duke appears and bribes Giovanna, who lets him see Gilda whom he’s seen in church. He declares his love for her and tells her he is a poor student. After he has left, Gilda tenderly reflects on her newfound love. The Duke’s entourage gathers nearby, intending to abduct Rigoletto’s “mistress.” When Rigoletto arrives, surprising them, they convince him they are abducting the Countess Ceprano, and enlist his aid in their scheme. Successfully deceiving Rigoletto, they kidnap Gilda. When Rigoletto discovers that his daughter has been taken, he collapses as he remembers Monterone’s curse. Arriving at his penthouse apartment in the casino, the Duke is distraught, having immediately gone back to see Gilda only to find her missing. When his entourage returns and tells him the story of how they abducted a girl from Rigoletto’s apartment and left her in the Duke’s bedroom, he realizes it is Gilda and hurries off to her. Rigoletto enters, looking for Gilda. The entourage is astonished to find out that she is his daughter rather than his mistress, but they prevent him from storming into the Duke’s bedroom. Rigoletto violently denounces them for their cruelty, then asks for compassion. Gilda returns from the Duke’s room. She tells Rigoletto of the Duke’s courtship, her abduction, and her deflowering by the Duke. Monterone is brought in to be killed by the Duke’s men, and Rigoletto swears that both he and the Arab will be avenged. Gilda begs her father to forgive the Duke. Rigoletto brings Gilda to a seedy club on the outskirts of town where Sparafucile and his sister Maddalena live. The Duke appears, and Gilda and Rigoletto watch him through the window as he amuses himself with Maddalena. Rigoletto tells his distraught daughter to leave town disguised as a man and, after she leaves, pays Sparafucile to murder the Duke. Gilda returns to overhear Maddalena urge her brother to spare the Duke and kill Rigoletto instead. Sparafucile refuses but agrees to kill the next person to arrive at the club, so that he will be able to produce a dead body for Rigoletto. Gilda decides to sacrifice herself for the Duke. Her plan succeeds and Sparafucile and Maddalena put her body in the trunk of a car. Rigoletto returns, and assuming the body is the corpse of the Duke, gloats over his revenge. But when he hears the Duke singing inside the club, he realizes he has been duped. He quickly removes the hood covering the head of the body in the car and is horrified to find it has been masking the identity of his dying daughter. Gilda dies asking her father’s forgiveness and Rigoletto realizes Monterone’s curse has been fulfilled. Verdi's Rigoletto, from the Metropolitan Opera in New York.